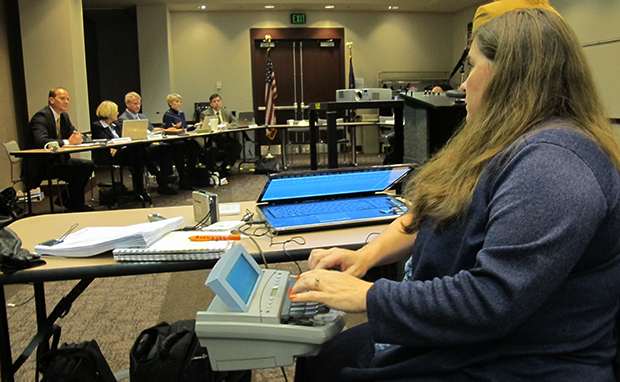 A court reporter transcribes the events of the State Board of Education meeting, even though state superintendent Glenda Ritz had declared the meeting adjourned without a vote of the panel. UPDATED, 5:15 p.m. Eastern — A meeting of the state’s top education policymakers descended into chaos Wednesday after state superintendent Glenda Ritz suddenly declared the State Board of Education session adjourned without a vote of the panel. 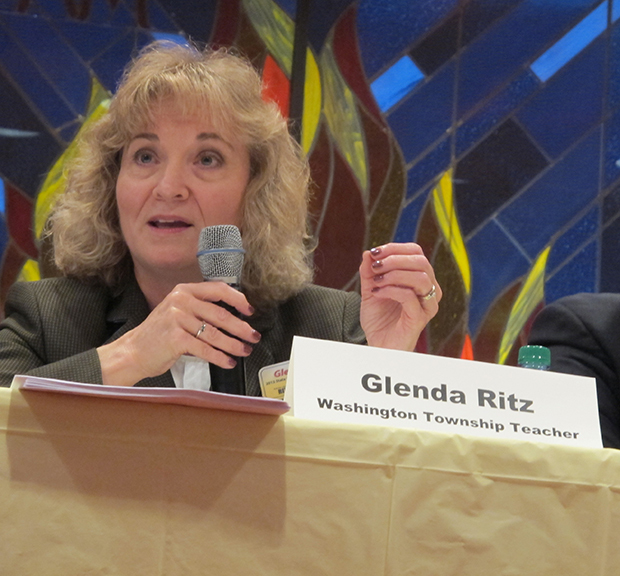 It’s a new low in the already-tense relationship between Ritz and the agency Gov. Mike Pence created to oversee the State Board as the two sides vie for control of the state’s school policy agenda. Directly at issue was a motion put forth by State Board member Brad Oliver that would allow the staff from Pence’s agency, the Center for Education and Career Innovation, to use their budget to bring in experts to advise the panel as it reviews the Common Core academic standards. 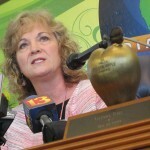 Ritz objected, saying the Indiana General Assembly’s Common Core “pause” law required the Department of Education to lead the review process. “I’m making a motion to table this,” Ritz told board members at the meeting, “so we don’t continue to have the back-and-forth with the legal staff at this meeting,” adding she would wait for definitive word from the Indiana Attorney General’s office whether Oliver’s request was in-bounds. Oliver moved for a vote on his motion. After a brief recess during which Oliver, Ritz and lawyers for the Department of Education and CECI left the room; Ritz blocked him, ruling the motion “improper” because, she said, it would cause the board to take illegal action. Board members began to object. With board members pushing for a vote, Ritz said quietly, “This meeting is adjourned.” She got up and followed much of her staff out the door. “I think you saw the tension come to the surface between who sets policy and who chairs the meeting and can a chair rule that somebody’s resolution is not appropriate,” Oliver told StateImpact afterward. Oliver says he had a lengthy meeting with Ritz’s staffers about bringing his motion before the panel. 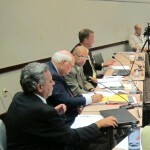 A link to the motion accompanied the State Board meeting agenda item on the Department of Education website. Oliver says despite his discussions with Ritz’s staff and having raised the issue at previous meetings, he was surprised to hear the state superintendent’s objections. “I think she was prepared to shoot down the motion even ahead of time. It was pretty scripted out from what I can see on the table,” Oliver said. But Ritz told reporters Oliver should not have been surprised. 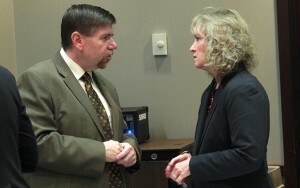 “He and I had an actual one-to-one conversation yesterday, and I told him the resolution was not proper,” Ritz said. Ritz expressed willingness during Wednesday’s meeting to bring in higher education experts to advise the State Board during the Common Core review process. But she said the Department of Education and State Board’s relationship in the process as comprehensive as adopting academic standards requires checks and balances. For his part, Pence told reporters he “regretted the misunderstandings and the friction” that have emerged between Ritz and the State Board.